It's mid-September, and we've already been bombarded with posts, pictures, and videos about childhood cancer. 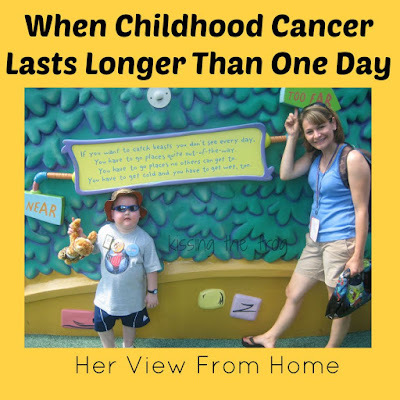 It can be overwhelming, both to soft-hearted people who hate to see children suffer, and to parents of children who are battling or who have battled cancer. I have to admit, even though I lived with it for nearly 14 months, it's still difficult for me to read certain stories and look at certain pictures. I am sharing a thank you on Her View From Home this month to all of the people who dedicate time and energy to helping with the cause: for strapping on running shoes or organizing a lemonade stand or even donating money - I thank you. I'm also sharing some tips on how you can help, places you can donate, and things to consider before donating money. Please share if you feel the information would be helpful to someone. You can see the post here on Her View From Home.